I have decided to try my hand at making a few historically accurate (within reason*) viking shields, for display purposes. I have been researching off and on in my spare time for a few months, but there are still a couple of things I am having trouble finding out. The wood I will use is linden, I have a steer hide (with all the hair and other such things still attached), and some thick scrap steel that I think will be sufficient for at least one, maybe two shield bosses. My first problem is that the shields taper from a thicker centre to a thinner edge. While this is, in and of itself, not a problem, I am not quite sure how to go about it. Would the front be left flat, with the wood remove from the back, to make the back slightly convex, or the other way around? Was it removed from both sides? And how far from the boss do you go before you begin the taper? I am also unsure whether to face the shield with leather or rawhide. Leather will require more work (tanning), and be more resilient to rotting, if I am correct. Rawhide is stronger and would seem a better choice, but I have read about someone facing their shield with rawhide, only to have it shrink, and destroy the the shield. I am rather frightened at the idea of carefully making a shield, and having at the brink of completion, only to have it self-destruct. * I say within reason, because I'm not going to worry myself over the fact that my linden is basswood (north american linden) rather than european lime wood, or that I am not using bog iron, or that it will not be an exact replica of an existing shield, etcetera etcetera. It doesn't have to perfectly mimic an artifact to be within historical parameters. They suggest that a shield would be faced with either leather or possibly linen (scroll down to see why you might want such a facing). Rawhide would be a better choice for the edge of the shield, to help protect it from damage. As for the tapering, I've no idea and the site doesn't seem to address that aspect. Aaaah, I have spent much time on the hurstwic site. Yes, rawhide is what I am planning to use to edge the shield, though I think I will stitch the edging, rather than rivet (or are those clench nails?) it. Thanks though, it is very encouraging to get a reply so fast. I don't know if any shield has survived enough to give you a historic answer on the tapering. I am interested to see what you decide to do. I would probably use leather on the face. You probably already found this. If you want to face the shield with rawhide, don´t soak it. Glue it to the surface when it is dry. If you soak it, it shrinks alot, and might ruin your shield. Have you considered using linen for the covering? I recently built a plank shield and found linen to be a very effective covering material. It works even better if glued to the face of the shield with the direction of the weave set diagonally to the grain of the planks. Its porous texture also makes for an excellent surface to receive paint. Just be sure to weight the shield down to keep it flat while the glue used to affix whatever material you choose is drying. Even with linen and the diluted wood glue I used, there was more warping than I expected, and the weights really were necessary. Have you considered using linen for the covering? I did consider it, but decided to use hide or leather instead. Even if I wanted to switch now, I already have the hide, so I am already set on that course. I'm going to rinse the salt out of the hide today, so I can begin de-hairing tomorrow. I am leaning to leather now, but I need to clean and dehair the hide, regardless of whether the end product is tanned or not. Thanks for the help, but I am still wondering about the taper. I had a computer crash a while back that took my bookmarks with it so I could not quickly find the documentation that I used when looking into the tapered edge question. However, I seem to remember a diagram showing the taper being a result of material removed from the face of the shield. I believe that it started quite close to the boss in the diagram, but that may have been an oversimplification. Overall thickness compared to the thickness at the edge seems to vary and this likely does as well. I chose to taper the face of the shield largely to facilitate a more simple attachment of the grip. Shaping it (and supplemental cross braces if you plan to use them) to fit a convex surface did not appeal to me. Instead of a consistent slope from the boss to the edge I started at the edge and tapered with a very slight curve to blend the slope into the face of the shield about six inches in. I used a surform for this, and it removed the material from my poplar planks nicely. It should serve just as well for linden. As a side question, do you plan to paint your shield? I opted for milk paint mixed to look as similar to orpiment pigment as I could find without the toxic side effects. If you are taking the time to process your own hide I would love to see what sort of paint you plan to use. I seem to remember a diagram showing the taper being a result of material removed from the face of the shield. Wow. Thanks so much! That does make a lot of sense, even if it means fitting the leather to the front would be a little harder to do. Many thanks! I hadn't exactly made up my mind on that. The time necessary to process the hide lets me put off a few decisions, like the paint. I am making more than one shield though (I think three or four), so I would have one for myself, one for my father (who is as interested in vikings as I am), and another one or two (possibly to sell), so I am currently considering only painting some of them, and leaving others with a bare leather face. As to the kind of paint, milk paint sounds good, although i think there is also a kind made with egg, but I am unsure if this would be appropriate for a viking shield. I do know that for glue, there is a form of glue made from curtling milk (with heat and vinegar) with a little lime added in, and was recomended specifically for shields, but I don't know the specifics. I'll try to take pictures of my progress for you, but for now a dung covered steer hide in the midst of a dirty mess in the snow does not make for interesting viewing. Some of the research I've done suggests that hide glue comes apart when wet, whereas casein glue or 'cheese' glue would not. by the way is this http://www.rocks4brains.com/glue.pdf the pdf you were referring to? I dont have much progress to report, but i think i might show some of the designs I'm thinking of adapting to the shields. 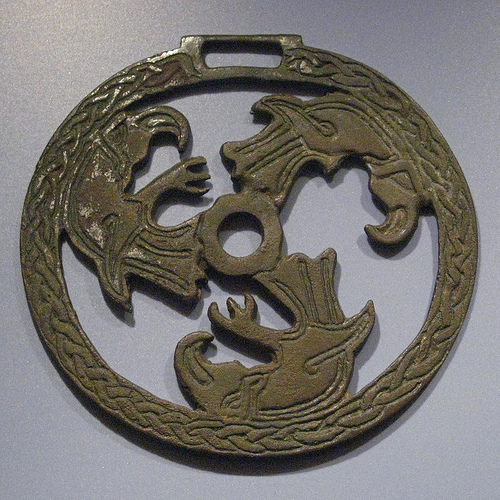 Since finding an old shield to base the painted design on the front is nigh impossible, I decided to take a look at disc brooches and pendants of the time, among other things. I am also taking a look at some rune stones and other things to see if some of those designs and motifs would be suitable for a shield face. I can't recall id this is viking or vendel, but it is one of the best things i have seen to base a shields decoration on. 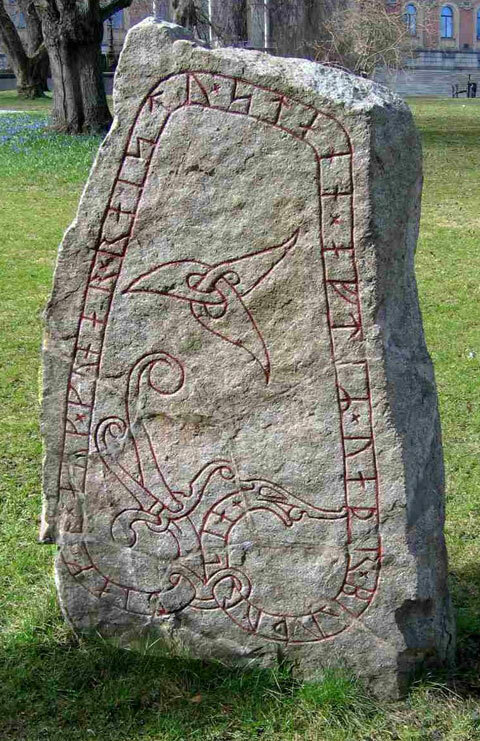 This runestone is Norwegian (I think). I am certain that the same design, made round to fit a shield, has some very serious potential, though I am not sure what I would want to have written on it for runes.